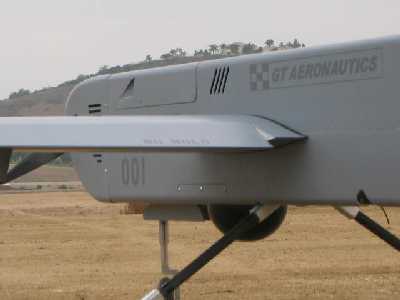 The GT-1500 RPAS is a modular unmanned aircraft system designed to fulfill multi-role applications in the short field takeoff and landing environment. 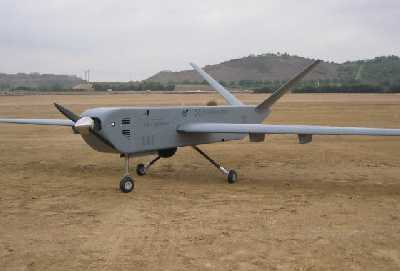 The aircraft incorporates multiple high-lift devices and "all-composite" construction to enable flight operations in confined rural and urban areas. With the high-lift devices stowed, the specially-designed laminar-flow airfoil allows the GT-1500 to cruise in excess of 100 knots, reducing the "base to on-scene" flight time and extending its range. The fixed landing gear provides robust capability in rough-field operations. The retractable landing gear (optional) reduces drag and includes a rugged shock suspension system, steerable nosewheel and brakes on the main wheels. The powerplant is an air-cooled, twin cylinder engine that incorporates an electric starter for inflight start and a generator system capable of 650 watts of inflight power. An internal 5 gallon fuel supply and wing station fuel can provide endurance exceeding 10 hours and 500 nautical miles. On-site assembly, launch, and operation are accomplished with only 2 personnel in 30 minutes or less. The aircraft can launch and recover from semi-prepared surfaces. The aircraft utilizes high-intensity LED and/or IR lighting for night operations. Night landings are performed using a portable IR night landing system. NOTE: The performance specifications listed above are calculated. The GT-1500 RPAS is currently completing flight testing. Performance specifications will be validated when all flight testing is complete.